By Srinivas Chowdary Sunkara // petrobazaar // 27th Nov, 2018. Fuel Oil front month futures prices are sliding along side of plummeting global crude prices. Both the front month Fuel Oil 180 cSt and 380 cSt graded prices shrank $10 or 2.13 pct yesterday and traded flat today. 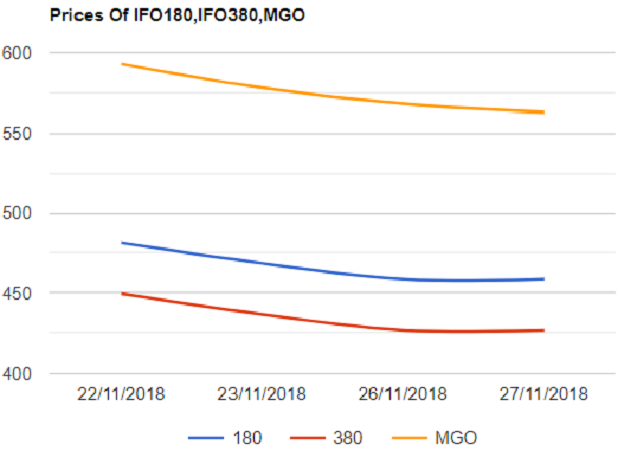 MGO prices are also trended down during the week in Singapore market. As per FIS report, Russian fuel oil exports sank to 2.233 million tonnes in Oct, down 14 pct from Sep and 24 percent from the same time last year. Russian fuel oil exports were last lower in April 2008 at 1.116Mts.